Yesterday, two black men were standing outside the Philadelphia Starbucks when they were arrested by the police. The men were waiting outside the Starbucks for their friend. Both of them were asked to leave, which has sparked an outrage across the nation. A video was posted on Twitter, shows other passengers complained that the men didn't anything wrong. The caption of the video on Twitter said, “The police were called because these men hadn’t ordered anything. They were waiting for a friend to show up, who did as they were taken out in handcuffs for doing nothing. All the other white ppl are wondering why it’s never happened to us when we do the same thing. The incident outraged the people and they asked for an apology from the coffee giant’s top executive. 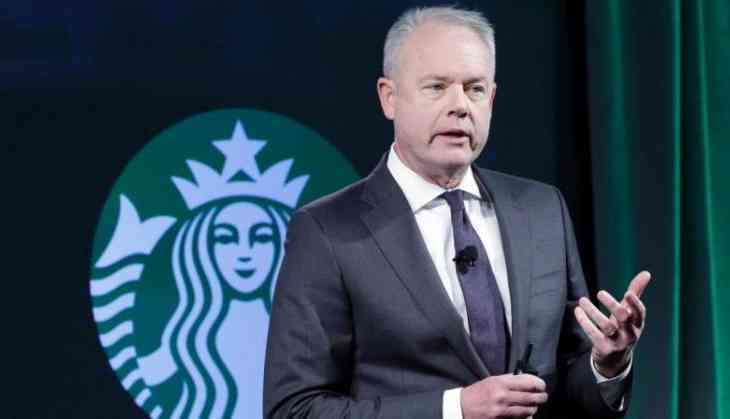 On Saturday, Starbucks CEO Kevin Johnson expressed his “deepest apologies” to the men, who were arrested on Thursday after refusing to leave the coffee shop because they did not make a purchase. CEO Kevin said, “I hope to meet personally with the two men who were arrested to offer a face-to-face apology." Starbucks posted a statement on their Twitter page, “We apologize to the two individuals and our customers and are disappointed this led to an arrest. We take these matters seriously and clearly have more work to do when it comes to how we handle incidents in our stores." I can't wait to hear this 911 call. Manager: Police I have an emergency. 2 black men are sitting in my shop and they haven't ordered anything. Philadelphia Police is conducting internal investigation as people have become aggressive. The accused men, Ross is sensitive to racial discrimination. He said, “As an African-American male, I am very aware of implicit bias; we are committed to fair and unbiased policing." He further added, “If you think about it logically, that if a business calls and they say that someone is here that I no longer wish to be in my business, they (the officers) now have a legal obligation to carry out their duties. And they did just that."